If you own the BioShock Infinite Season Pass, DO NOT purchase this content here as you will be charged again. BioShock Infinite required; sold separately. Xbox LIVE free membership required. [NOTE: This is part 1 of 2. Part 2 is required to play and is available at no additional cost.] See the world through Elizabeth’s eyes in BioShock Infinite: Burial at Sea – Episode Two. Set immediately after Episode One, this final episode puts you in the role of Elizabeth as she journeys through Rapture in an effort to rescue the little sister she abandoned. Burial at Sea - Episode Two features parts of Rapture you’ve never seen before, incudes stealth-oriented gameplay that brings you new weapons and plasmids, and involves nearly every major character from the original BioShock and BioShock Infinite. 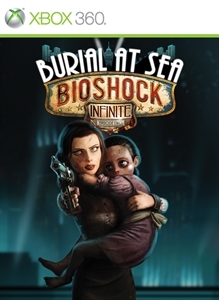 Burial at Sea - Episode Two is the last of three BioShock Infinite add-on packs and it concludes the storyline of BioShock Infinite and Burial at Sea. This pack will contain new Achievements.